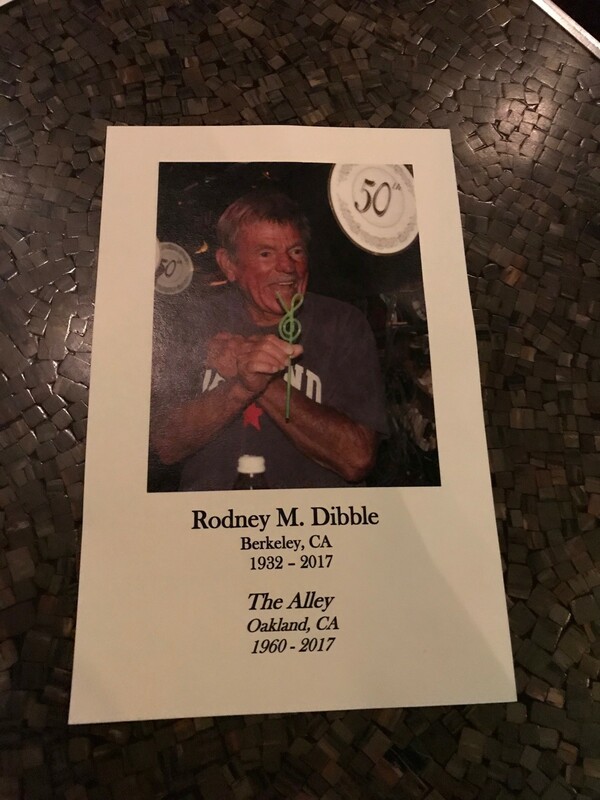 A memorial was held at The Alley over the weekend for Rod Dibble, the dive bar’s resident pianist since 1960, who died on Dec. 18 at the age of 85. For someone who once said he’d “be very happy to die right behind this piano here,” it was a fitting presentation, almost as if Dibble had merged with the bar itself in his afterlife. On Saturday afternoon, the first day of the weekend-long send-off, there was a long spread of finger sandwiches, “piping-hot” wings, and snacks gracing the ancient bar, as Bryan Seet, one of Dibble’s two replacements, tickled the ivories. Friends, family, and fans of the iconic Oakland musician gathered around the piano, trading songs from the Great American Songbook and stories of the great man himself. “Singing here around this piano was the first time I ever sang in public,” said one reveler, before launching into an old standard, then bringing in his saxophone for accompaniment. Among the memorials on display were pages and pages of printed memorials from The Alley's Facebook page; it seemed like everyone in the city of Oakland had been touched, in one way or another, by this scene that Dibble created. There was also the hefty tome of laminated press that might as well double as a memorial to papers and writers long gone. But the most dominant element of the afternoons in The Alley were those songs, constant and pure as they ever were, even if the notes behind them felt a little heavier than before.